Geneva is a city of water: tap water is delicious, swimming in the lake is the best and the Fountain is one of the most iconic symbols of the city. The Services Industriels de Genève (SIG) manages the energy networks and water in Geneva, which is pretty boring, but thankfully there’s a bit more to it! Indeed, for years this public institution has been developing a sustainable policy, and one part of it is a free gallery with really interesting exhibitions about the environment, humanitarian topics, art and heritage. 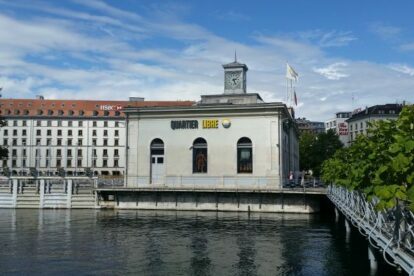 The Quartier Libre (“Free Area in English) gallery is wonderfully and symbolically situated in the middle of the Pont de la Machine, above the Rhone River, in an old industrial building. Two to four temporary exhibitions run every year. They have the perfect size for a small cultural break and the museography and explanations are good. The focus is as varied and intended to a broad public, such as with the previous exhibitions about Hundertwasser, Keith Haring or about art & tramway. Texts are in French and, depending on the exhibitions, also in English. And if you are looking for a refreshing and useful souvenir of Geneva, you can also buy their carafes of “Eau de Genève”.